A driver prepares a forklift truck that has been modifi ed by Pyroban to EN1755: 2000 and American standard UL NEC500/505 and prepared to GB19854-2005 Chinese specification. Preparing forklift trucks for operation in extreme and dangerous environments is a job for professionals. Ruari McCallion has received some guidance from Pyroban on regulations and appropriate modifications. Cat® Lift Trucks can confidently say that its forklift trucks are suitable for most normal materials handling circumstances, but there are situations where special treatment is necessary. Chemicals and explosives are obviously hazardous, as are industrial gases, for example, but even everyday items such as foodstuffs or drinks can also be dangerous. In the right – or rather, wrong! – conditions, even baking powder and flour can be explosive. If customers are operating in dangerous or challenging environments, then help and advice is at hand. “There is an extensive array of legislation within the European Union that covers hazardous materials and dangerous environments, along with the measures that are required to manage them and make them safe,” said Matthew Shirkie, Industrial Commercial Manager, EMEA, with Pyroban. Other countries have their own regulations and some – such as China’s – can require modifications over and above Europe’s. The two directives have been applied in individual EU states under national laws; DSEAR (the Dangerous Substances and Explosive Atmospheres Regulations), for instance, is the United Kingdom’s implementation of ATEX. Some of the requirements look like basic, sensible precautions – for example, ATEX 1999/92/EC requires companies to prevent the formation of explosive atmospheres in the workplace, or (where this is impossible) avoid the ignition of explosive atmospheres. But what the regulations do is to provide a framework and lay out clear common standards, which apply across the EU. While some materials will be recognised as potentially hazardous to handle even by lay people and non-experts, some are not so obvious. “The danger with flour, for example, is that fine particles of it can be explosive if suspended in the air in a confined space. A simple spark from an electric lift truck can set off a catastrophic explosion,” said Shirkie. ‘Effective ignition sources’ – i.e. things that could initiate explosions – range from open flames and lightning strikes to radiation and – importantly, in the context of lift trucks – mechanically generated friction sparks and electric sparks among others. Safe operation requires that forklift drivers should be properly trained for hazardous operations but the equipment they are using must be suitable for purpose. Making them compliant is a conversion activity in which Pyroban Group specialises. It has facilities in the UK, Netherlands, China and Singapore that convert forklift trucks and other materials handling equipment to ensure ATEX compliance. Zone 1 areas can be serviced by Category 2G electric trucks still equipped with their original DC motors, which are completely enclosed within explosion-proof casings. Category 3G trucks, which operate in Zone 2 areas, are typically fitted with enclosures on DC motors which prevent gas penetrating for up to a minute. The Pyroban system also detects gas and shuts the truck down if necessary. AC motors are non-sparking in normal operation and use a different technology to the 60-second enclosure. 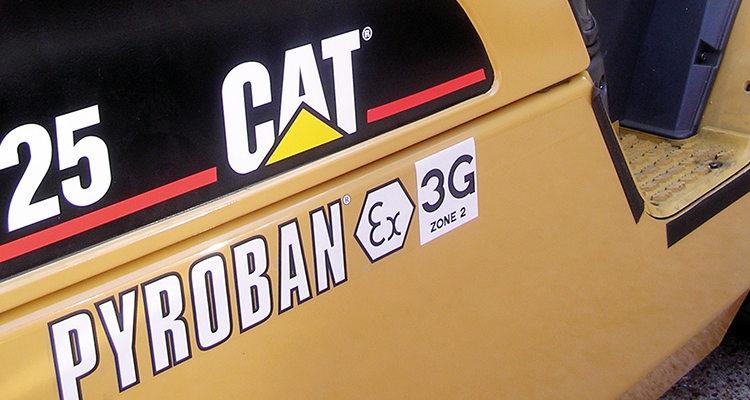 Cat® lift truck that has been prepared by Pyroban for ‘medium risk’ (Zone 2 operation) to Category 3G ATEX 94/9EC specifi cation. Pyroban’s modifications also include spark arrestors and shutdown valves in order to inhibit ingestion of gases, which can cause overspeed running and potentially generate exhaust flame. Safe operation requires that forklift drivers should be properly trained for hazardous operations but the equipment they are using must be suitable for purpose. Potentially explosive atmospheres are not the only challenges that forklift truck operators have to cope with. Heat and fine dust in aluminium smelters can clog up filters and accelerate wear in machine components. The heat has been known to melt rotating warning lights; a solution provided by Al Bahar, Cat® Lift Trucks’ dealer in the Middle East, was to provide an LED beacon with a different lens material. And the electromagnetic fields around aluminium smelter pots are strong enough to wipe credit cards and interfere with electrical equipment; as a result, such operations use diesel trucks, even indoors, rather than battery-powered units. The diesel trucks are also less likely to ignite any fine bauxite powder that hangs in the air. Modifications to ensure that air filters do not become clogged and that dust is kept out of the lubrication system are also part of the normal service. Even the tyres are special: they are solid pneumatic, providing the same shock-absorbing performance as normal units but without the risk of puncture. At the other extreme, Cat® Lift Trucks has been a sponsor of a project from the University of Utrecht which sent a solar-powered vehicle to Antarctica. Whatever the challenge, across a range of situations and temperatures, Cat® Lift Trucks has the expertise to rise to it. 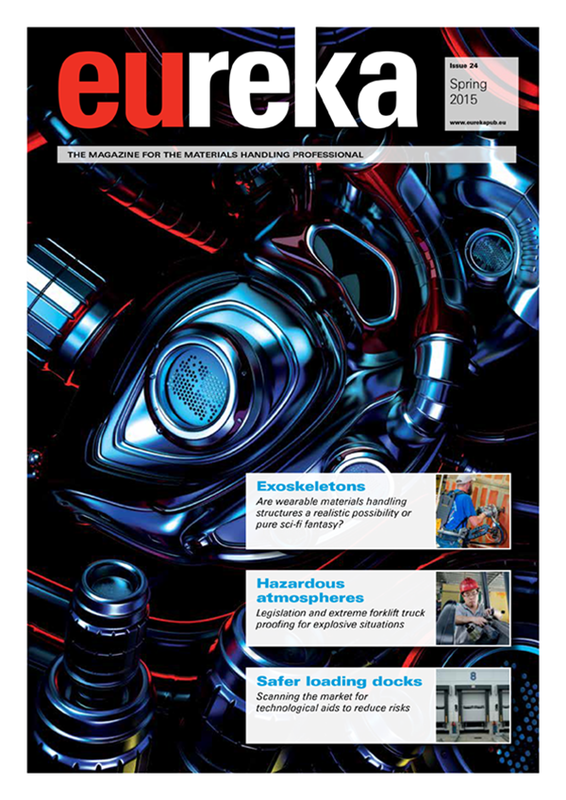 This article appeared in the 2015 Spring edition of eureka magazine.